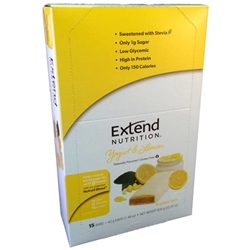 Extend Nutrition's Yogurt and Lemon Anytime Bars have 9 grams of high protein and only 150 calories. It has one net carb and 1 gram of sugar each case contains 6 boxes with 4 individually wrapped 1.48oz bars. Ingredients: Protein blend (soy protein isolate, whey protein concentrate), Prebiotic Tapioca Fiber, No Sugar Added Lemon Layer (Maltitol, Vegetable Oil (palm kernel oil, palm oil), Water, Whey Protein Concentrate, Vegetable Glycerine, Contains less than 2% of each of the following: Pumpkin Juice for Color, Natural Flavor, Soy Lecithin, Sodium Citrate, Salt, Carrageenan), Uncooked Cornstarch, Vegetable Glycerine, Almond Butter, Maltitol, Soy Protein Isolate, Sorbitol, Palm Kernel Oil, Calcium Carbonate, Natural Flavor, Milk Protein Concentrate, Rice Starch, Vitamin and Mineral Blend (Alphatocopherol Acetate, Biotin, Vitamin A Palmitate, Niacinamide, Riboflavin, Ferric Orthophosphate, Calcium Pantothenate, Zinc Citrate, Vitamin K, Vitamin B-12, Folic Acid, Vitamin D-3, Thiamin, Pyridoxine HCI, Manganese Gluconate, Copper Gluconate, Potassium Iodide, Sodium Selenite, Chromium Chloride Hexahydrate, Sodium Molybdate Dihydrate, Dicalcium Phosphate, Magnesium Oxide), Whey Powder, Salt, Palm Oil, Soy Lecithin, Citric Acid, Stevia. Contains tree nuts, milk, and soy. 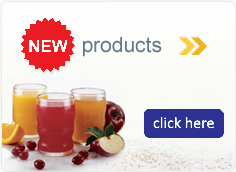 Manufactured in a facility that processes eggs, wheat , nuts, and seeds.